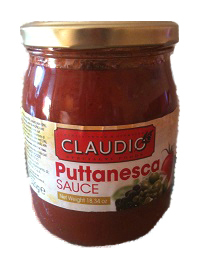 Imported from Italy, our pasta sauce is made with the finest all natural ingredients: Chopped Italian Tomatoes, Tomatoe Paste, Black Gaeta Olives, Green Olives, Extra Virgin Olive Oil, Capers, Anchovies, Onion & Salt. The perfect compliment to your favorite pasta! Try some today! !